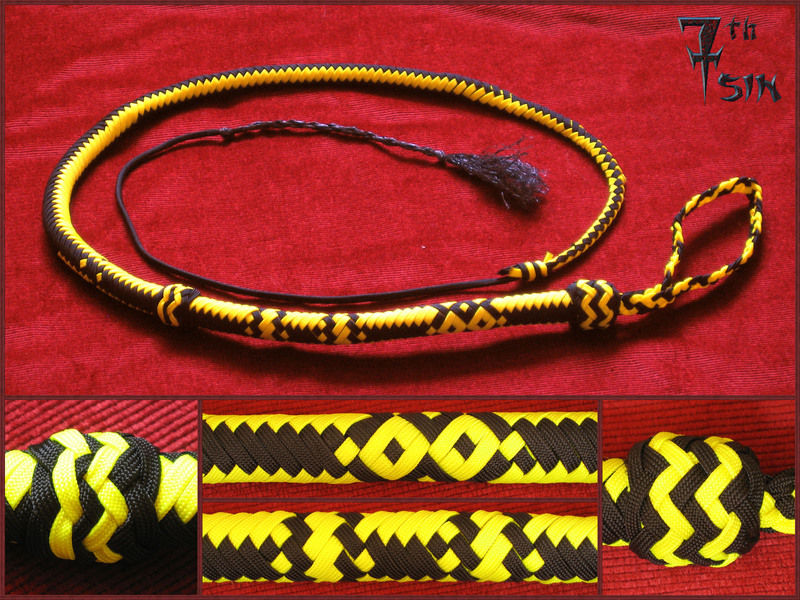 A 4 feet, 16 plait signalwhip made for my personal collection. A 3 feet, 16 plait singletail. Braided from the tip, no fall, no cracker. This whip is very stingy. The feeling is somewhat comparable with a very flexible cane. This 6 feet, 16 plait is made for Ed and maureen. 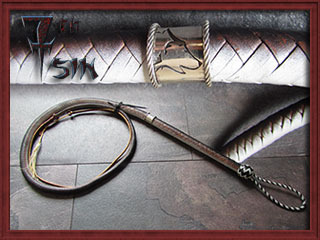 The silver ring with engraved wolfshead is made by Nuri. The whip is painted after braiding to achieve this look. A horsetail flogger with 64 plait handle and braided in initials for my personal collection. 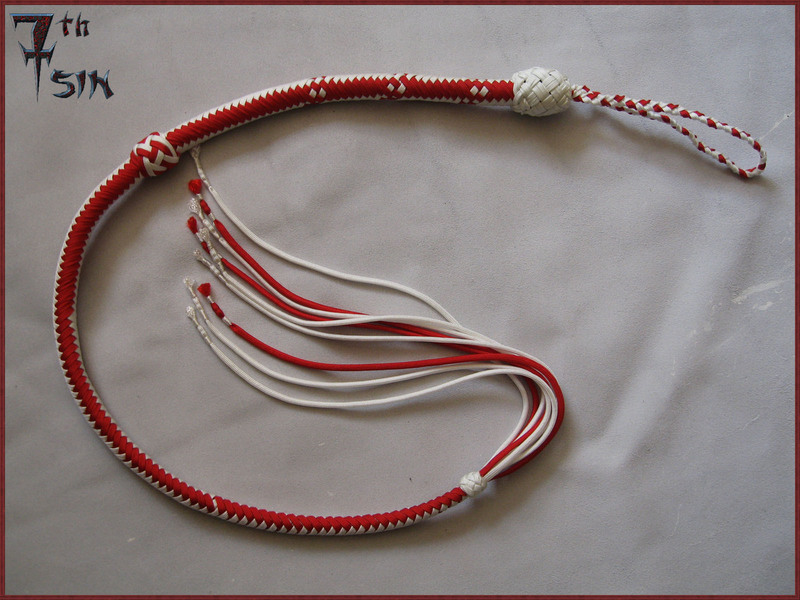 Even though this 4 feet, 16 plait signalwhip is designed to be used as a necklace, it's functional enough crack. This piece is used by Rik and sakia at their Ceremony of the Roses. 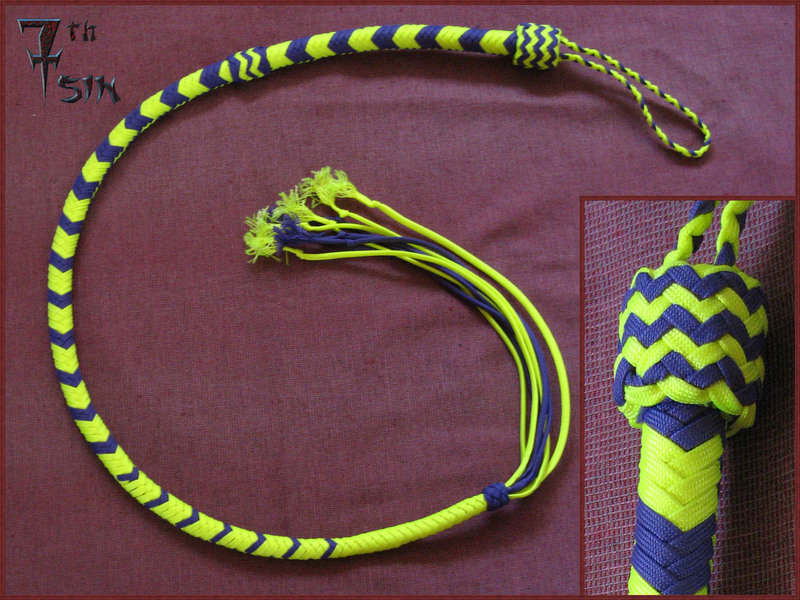 A 4 feet, 16 plait signalwhip created for Mrs Insolence and slfpeet. A zjuul's tails with braided in initial (M). Commisioned by Mistress Marjan and slaafje bart. 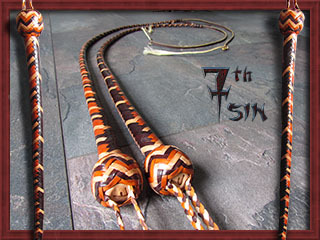 Twin 3 feet snakewhip, braided in a 16 plait in the colors Brandy, Saddle and Natural. 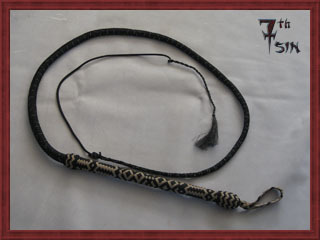 This flogger is 80cm (31.5 inch) long and has cowhide tails. The handle is braided with roohide in a 32 plait pattern. Made for Mr P and nouska. 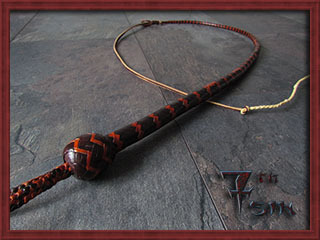 A 3 feet, 16 plait roohide snakewhip in Brandy and Saddle. 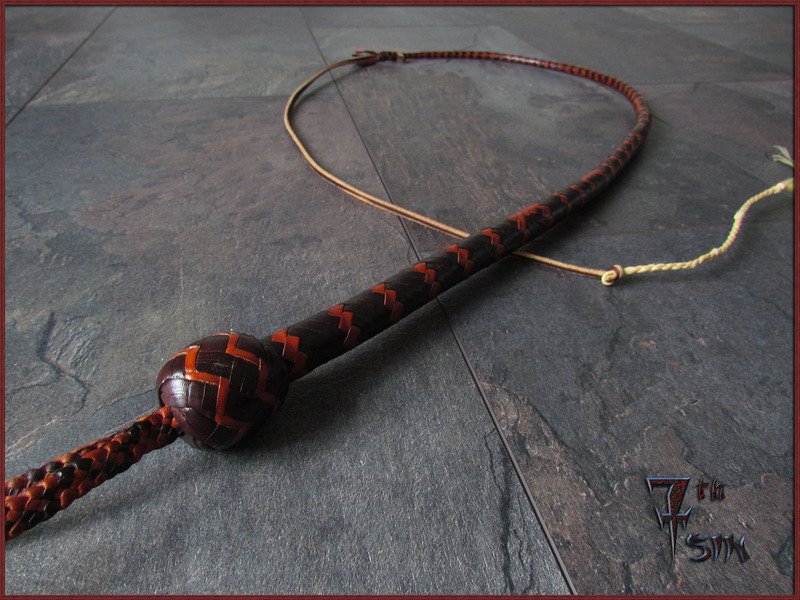 A 6 feet, 24 plait roohide bullwhip in Red and Black. 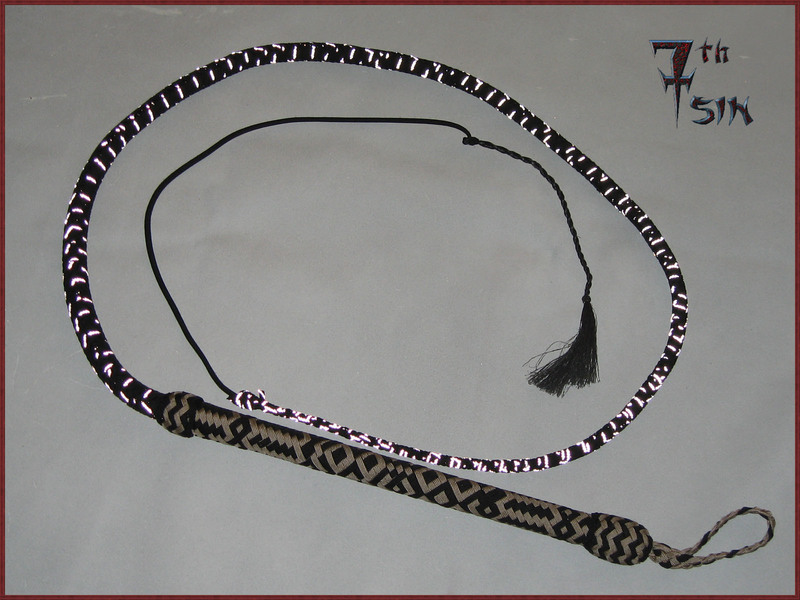 The pattern runs around the lenght of the entire whip. 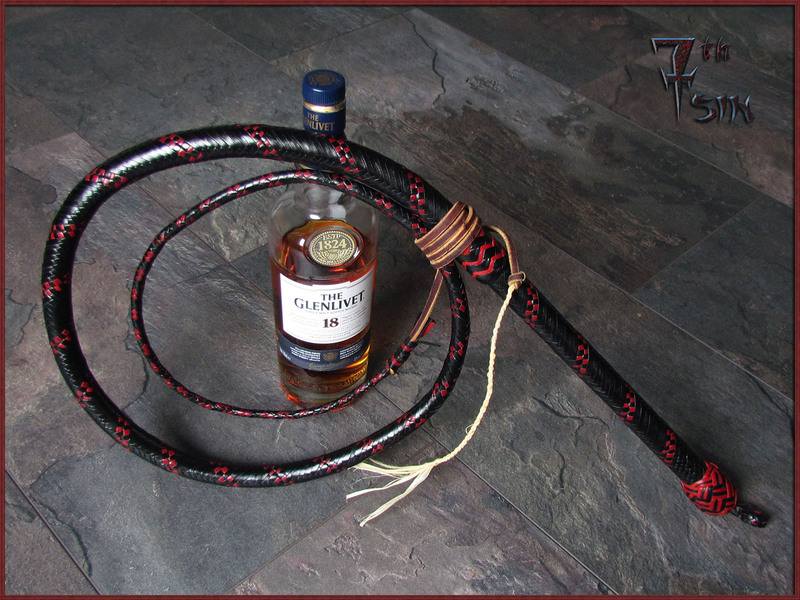 A 4 feet, 16 plait roohide bullwhip in Black, Whiskey and Saddle colors. 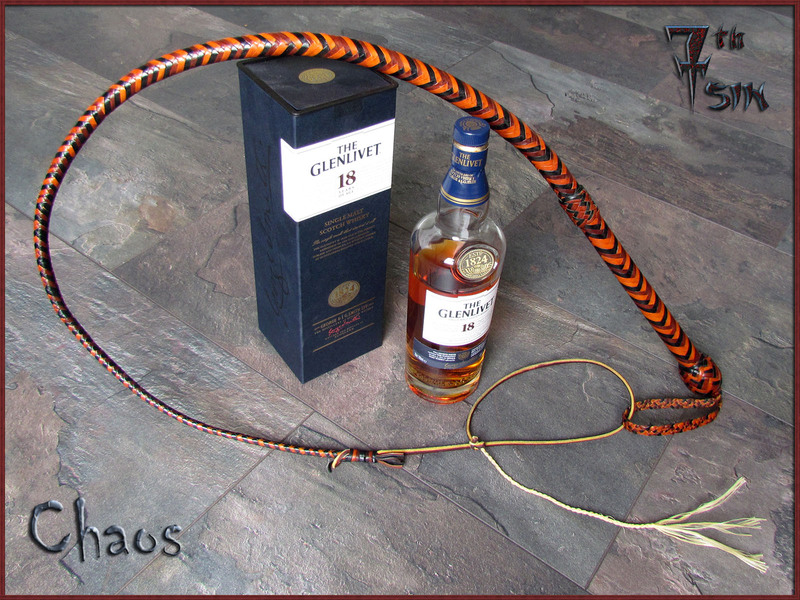 I rarely name whips that don't end up in my own collection, but this one I've dubbed Chaos. 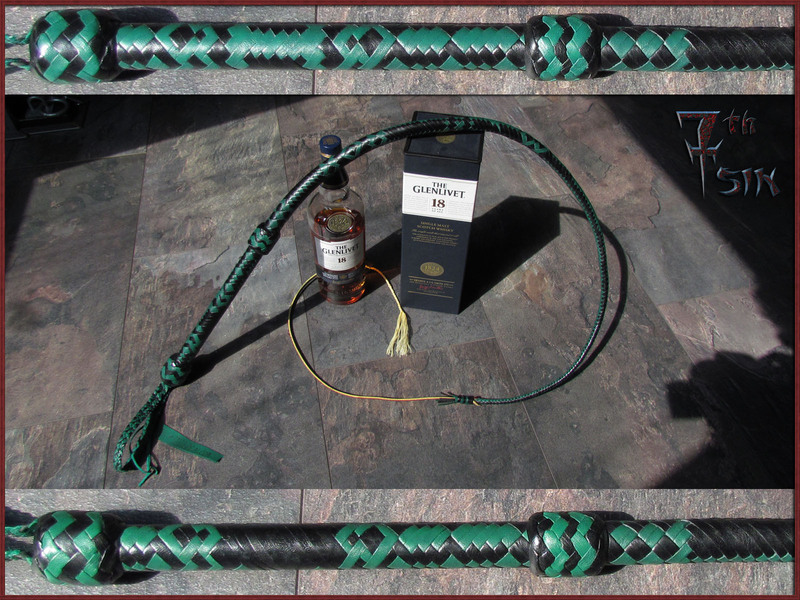 A 4 feet, 16 plait roohide bullwhip in Back and Green. Created for slppeet as a gift for his Mrs Insolence. 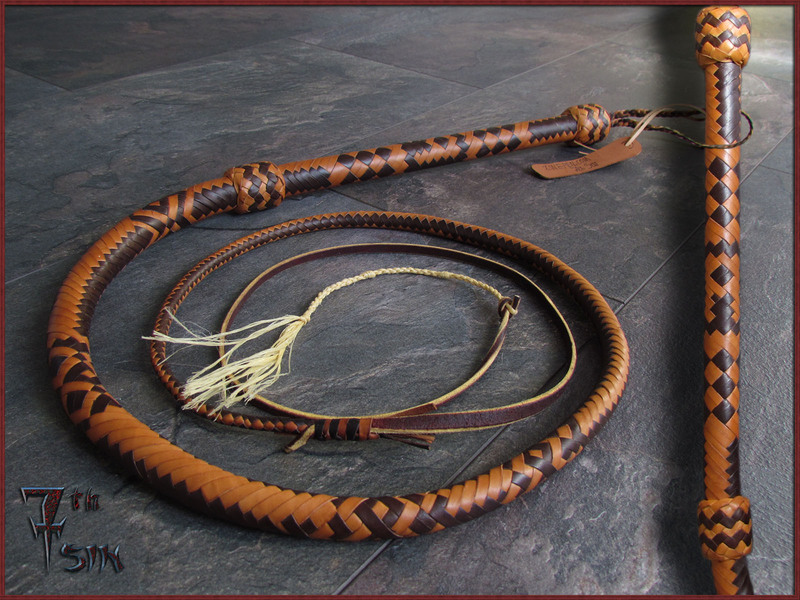 A 5 feet, 16 plait roohide bullwhip in Natural and Brandy. On request the initial "A" is braided into the handle. 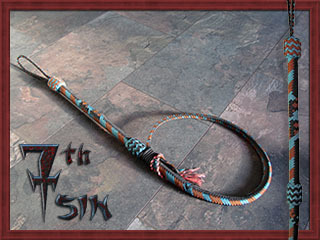 A 4 feet, 16 plait tri-colored bullwhip in Teal, Chocolate and Black with braided in initials. 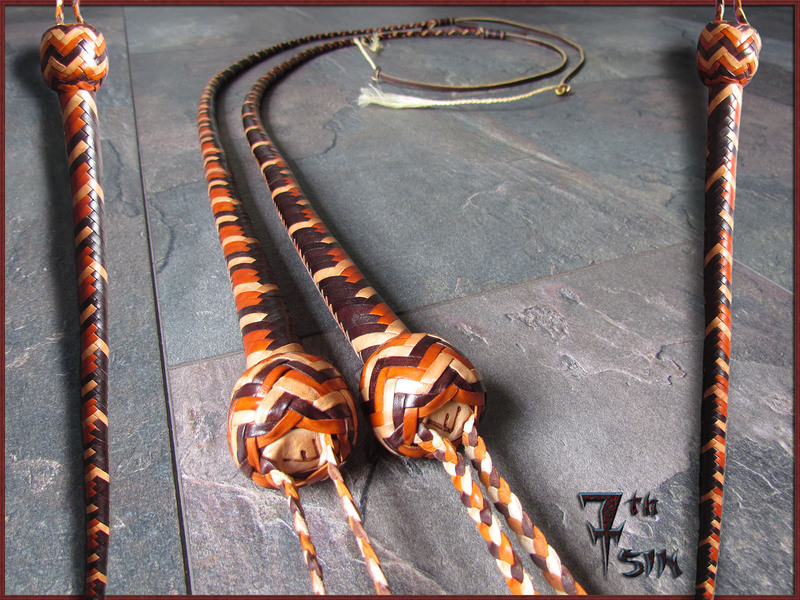 The top bullwhip is one of the first roohide bulls I've ever made. The bottom two are much more recent. This is a perfect illustration of the progress I've made as a whipmaker. 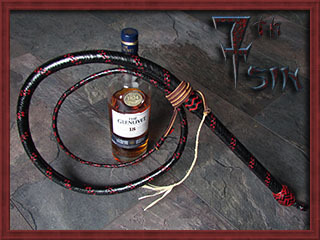 * Top: A 5 feet bullwhip with one belly over a shotloaded core. A 12 plait overlay on the thong and a 16 plait handle. 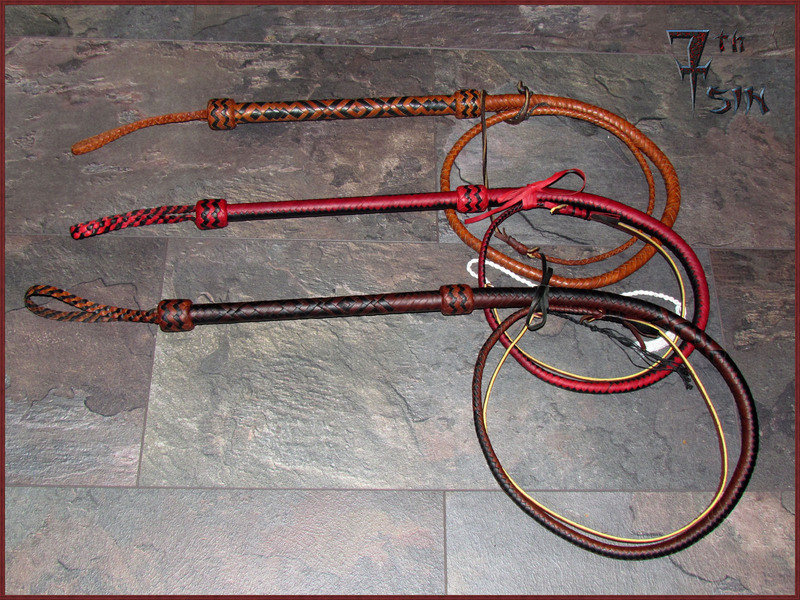 * Middle: A 4 feet bullwhip with two bellies, two bolsters and a 16 plait overlay. 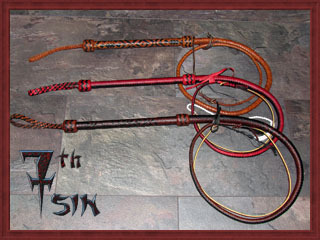 * Bottom: A 4 feet bullwhip with 3 braided bellies and a 16 plait overlay. No bolsters. 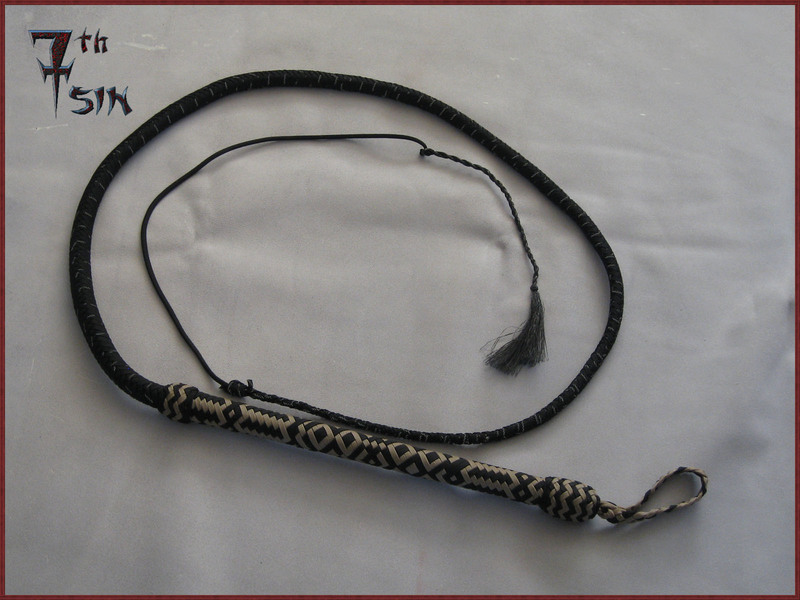 A variation on a snakewhip. 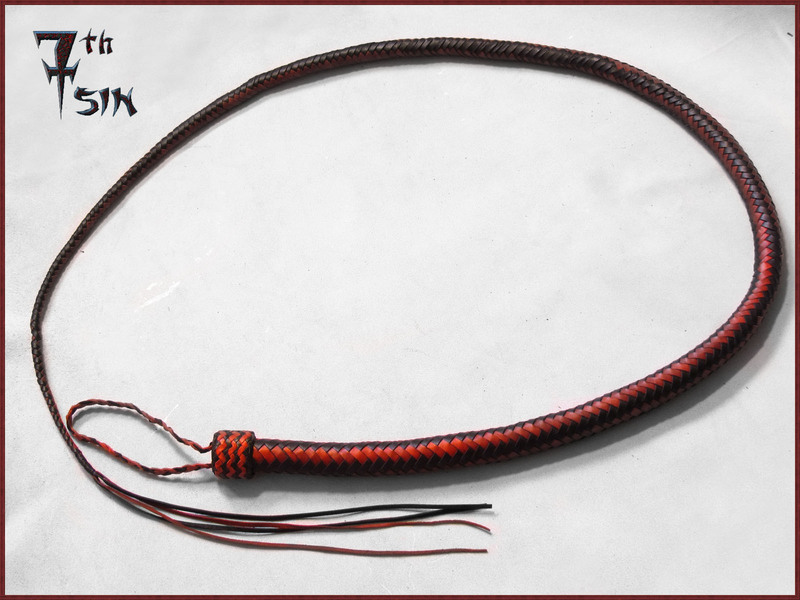 With this whip the redhide fall is part of the core of the whip. 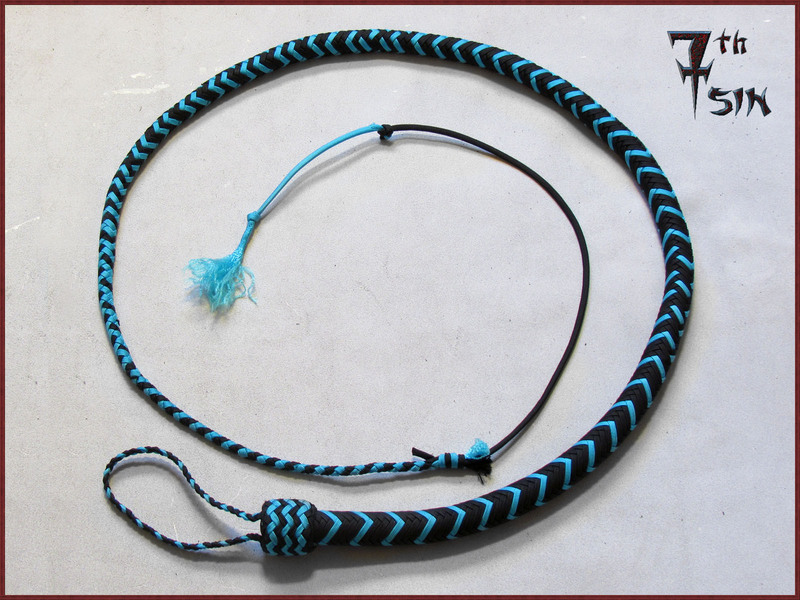 This whip is 4 feet long and sports a 16 plait overlay. Upon request this whip does not have a cracker. Needless to say it's a quite severe tool! 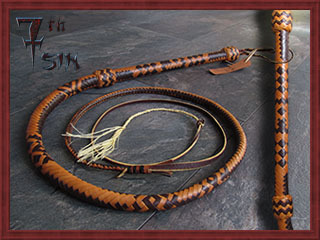 A 6 feet 16 plait roohide bullwhip. 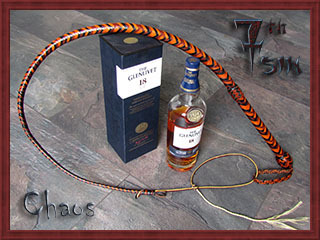 This set of whips is made for Lady Samantha by 7th & zjuuleke. 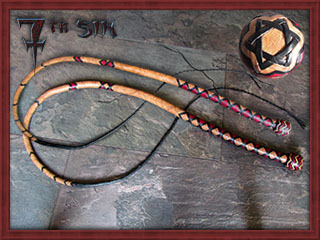 De snakewhip is crafted by 7th, the floggers are zjuuleke's handiwork. 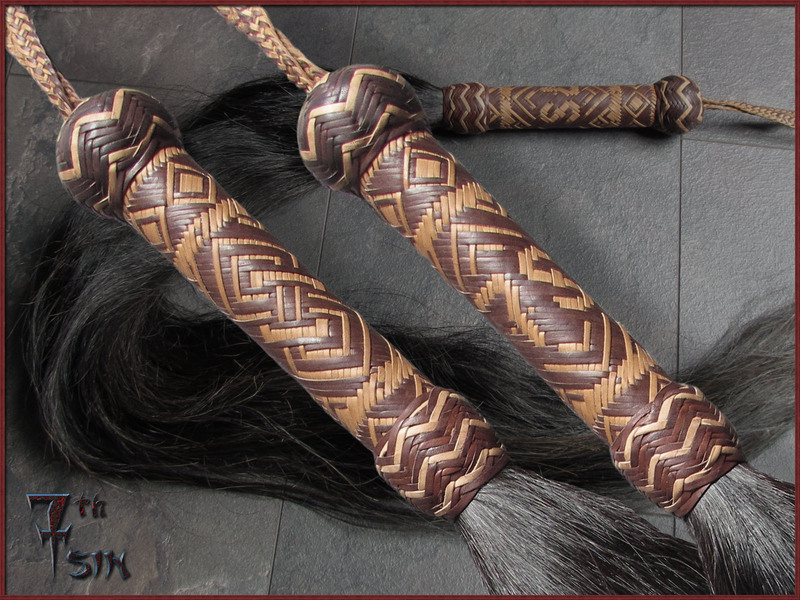 The handle has the same 16 plait pattern braided in as zjuuleke's floggers. 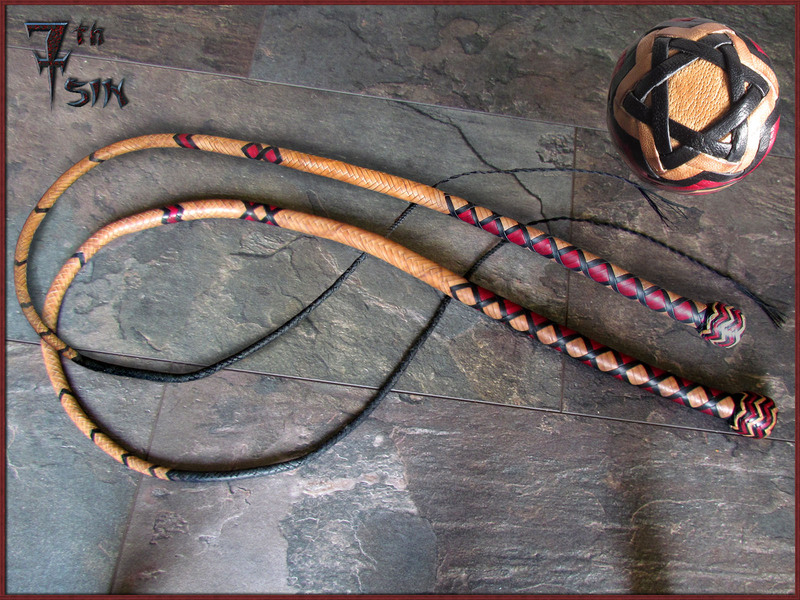 A 5 feet, 16 plait roohide bullwhip. 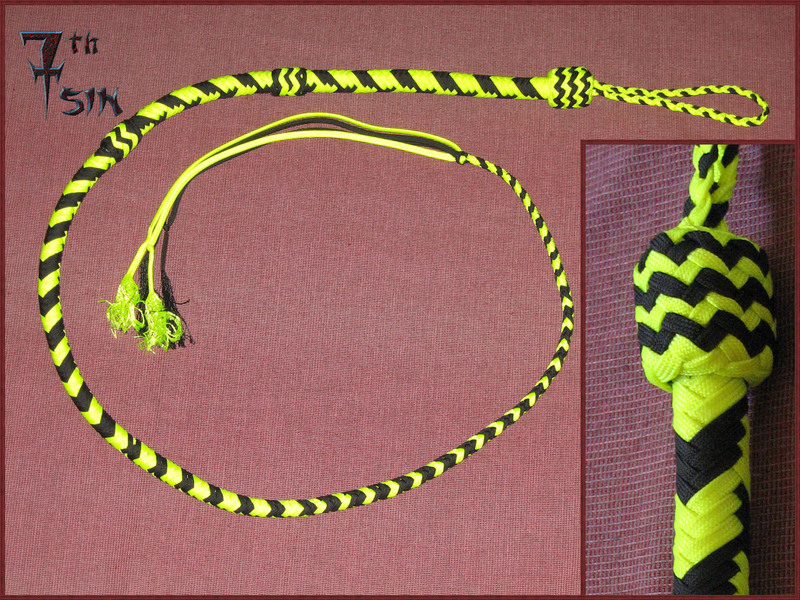 A 5 feet, 12 plait paracord bullwhip. 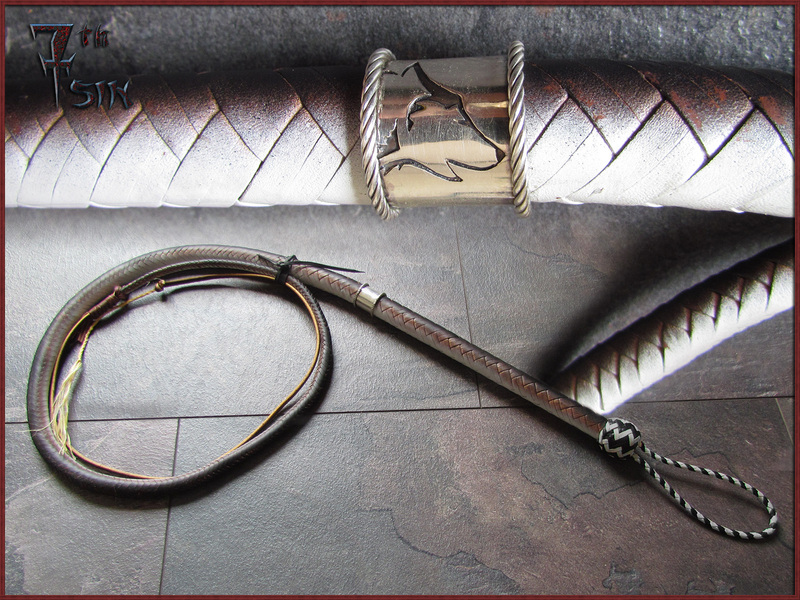 Set of matching floggers with a bit of bling. Each flogger is around 80 cm (31 inches) long. 8 plait roohide singletail ending in 4 falls. 3 foot, 8 plait roodhide snaketongue. 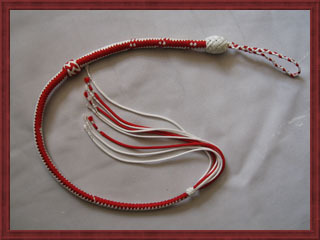 A 4 feet, 8 plait cowhide singletail ending in 9 tassels. Nearly a classic snakewhip. Only the cracker is omited. The fal is made from harnass leather for extra sting and packs quite a punch. The whip is 4 feet with an 8 plait overlay. 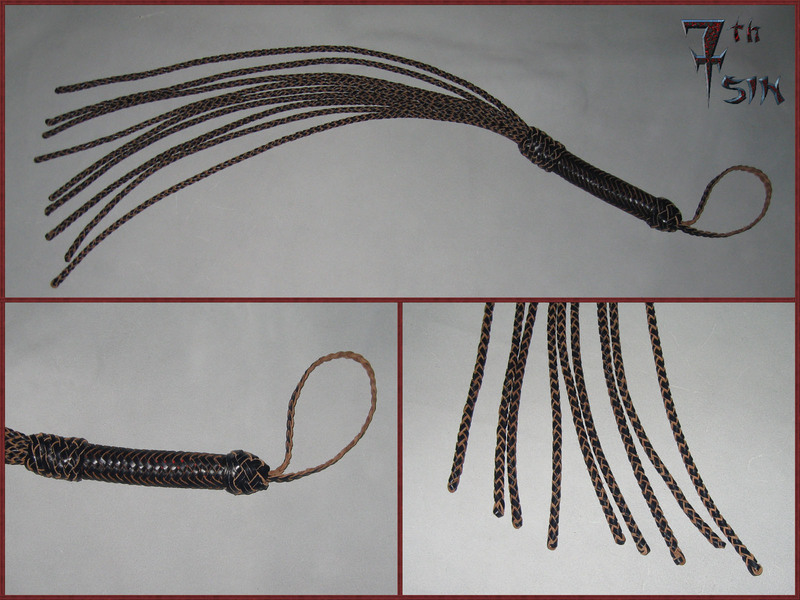 A cowhide flogger with 12 flat braided falls ending in tassels. 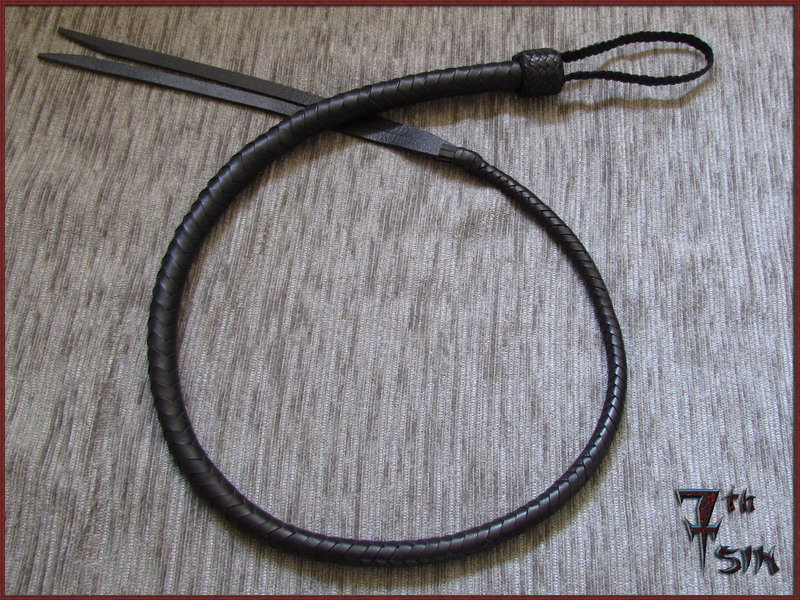 This flogger is 80 cm (31 inches) long. Made for Falcon en wolfje. A cowhide cat o' nine made for Fireman in the colors of his favourite soccerclub RSC Anderlecht. Matching set of floggers. Each flogger is 80 cm (31 inches long). Flogger 1 is a cat o' nine with the tails ending in short tassels. 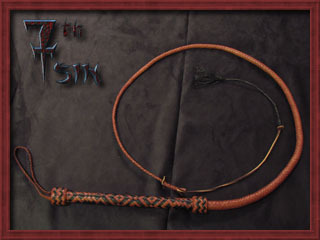 Flogger 2 is a cat 'o nine with the tails braided from the tip. 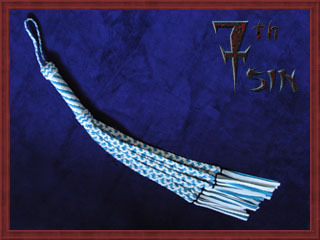 Flogger 3 has 12 flatbraided cowhide falls ending in tassels. 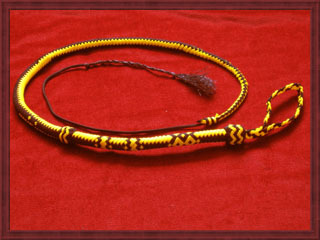 A cat 'o nine with the tails braided from the tip. A roohide singletail with 3 plaited bellies and a 16 plait overlay. Finished with a 10 bight, 9 part turkshead with a pinapple interweave. 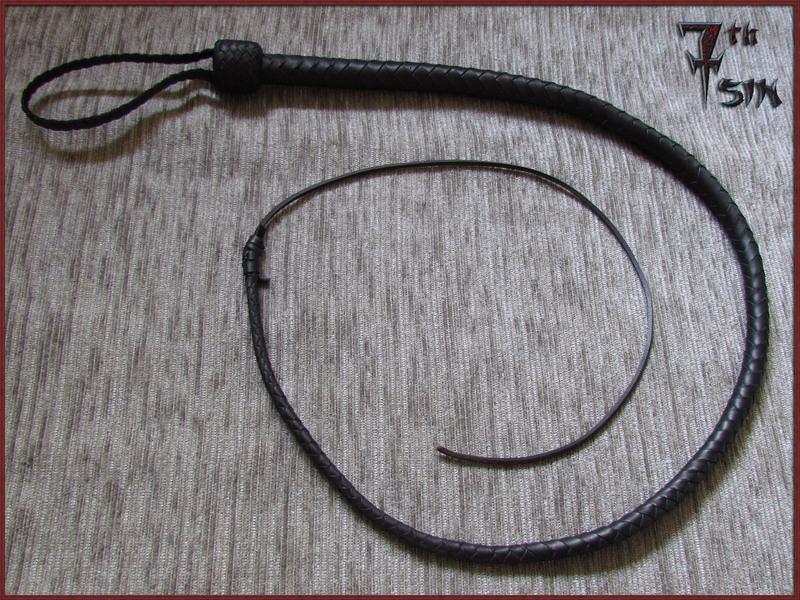 At 675 gram (24 ounches) this is a very heavy whip. I call it "the Beast" for a reason. 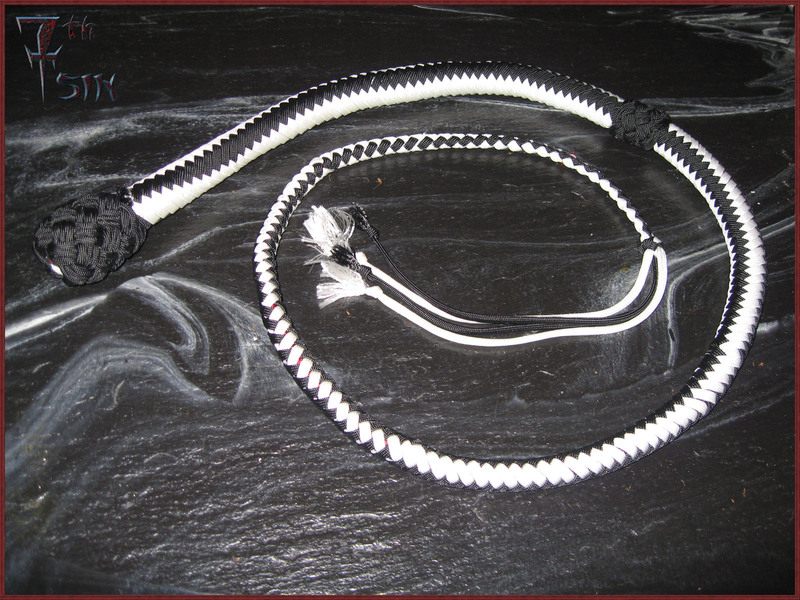 A 4 feet paracord snakewhip with 2 plaited bellies and a 16 plait overlay. 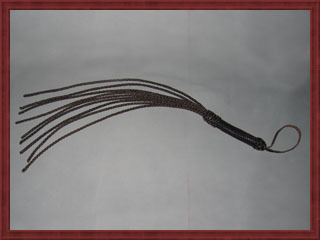 A cowhide floggers with 12 flaitbraided tails ending in tassels. Made for timara and named "timara's fun" by her..
Set of soft cowhide floggers. 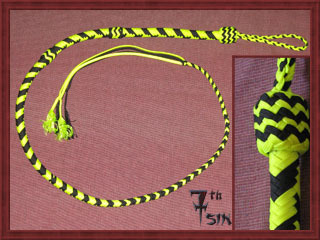 Apart from the colors these floggers are identical..
A 4 feet, 12 plait paracord singletail ending in 9 tails. This whip is made for Thunder and Angel. 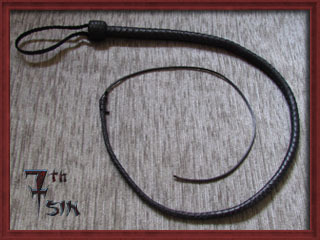 A cowhide cat 'o nine with the tails braided from the tip. .
A perfect companion to the other two floggers on this picture with a similar weight and lenght. 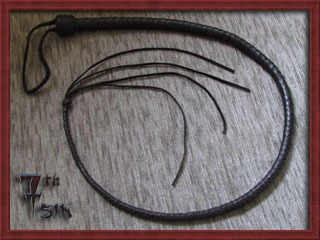 A soft cowhide flogger measuring 80 cm (31 inches) long. 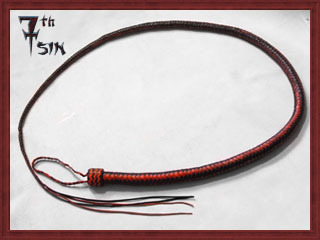 This flogger has 36 cowhide falls of 1 cm wide. This is the flogger with the flat falls. De flogger with the braided falls is covered on the picture below. They are perfect partners for two-handed fun. 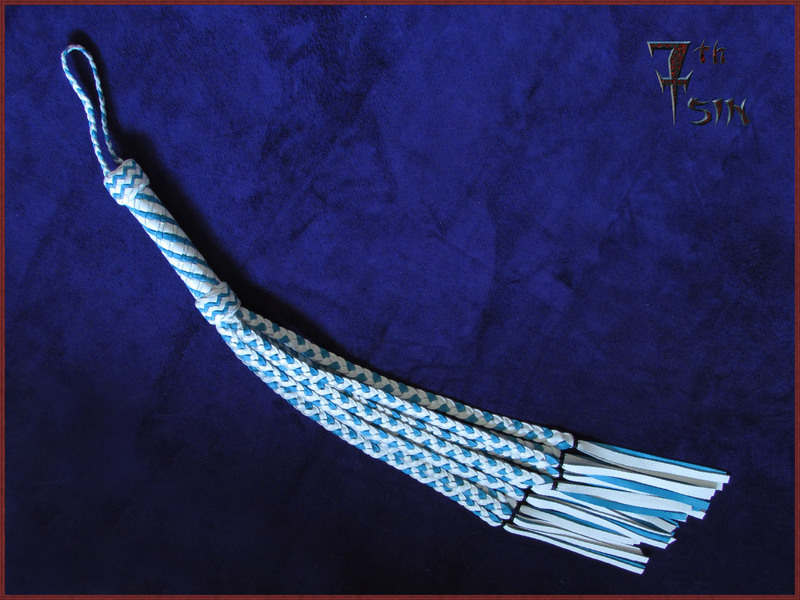 A cowhide flogger with 12 flat braided falls ending in tassels. This is quite a soft floggers, perfectly suitable for warming up. 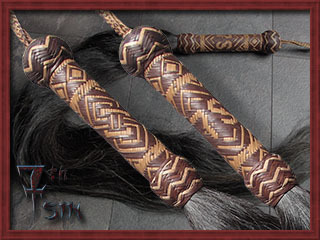 A matching set of floggers with 18 harnass leather falls each. 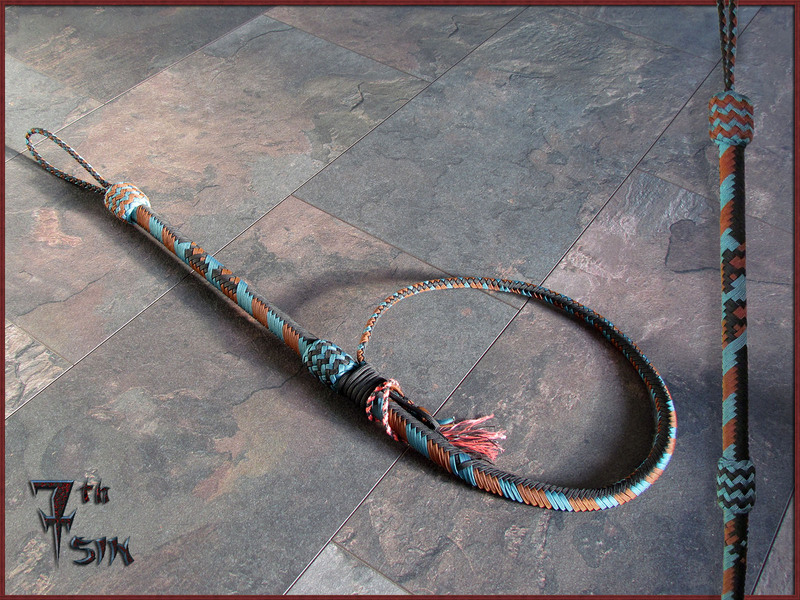 A 6 feet, 12 plait paracord bullwhip with a 16 plait handle. Made from reflective paracord. Click here for a photo taking with a flash to see the effect better. 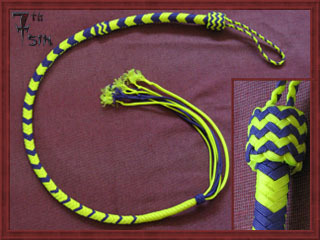 A 4 feet 12 plait snakewhip. The falls on this cat are braided from the tip for some extra punch. 4 feet paracord hybrid ending in 9 tails. 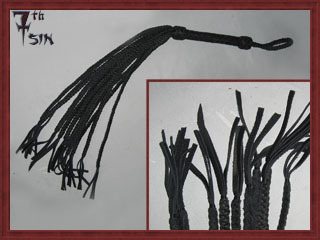 This flogger has 19 galls of 3.5mm harnass leather with a 12 plait handle. 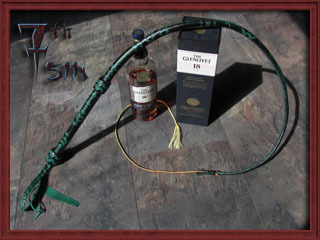 This is a variation on the classic snakewhip. Braided with 550 gutted paracord. This is the very first singletail I ever made. It looks rubbish and doesn't handle at all and is very sloppily made.